Palmares golf course is laid out on the side of a south-facing hill overlooking the Bay of Lagos. 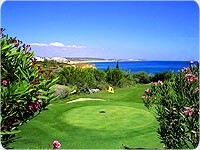 It questionably offers the most attractive sea views of all the golf courses in the Algarve. Five of the holes are placed on the sand dunes with the fifth, a par-5 of 550 metres making the hole a real challenge. 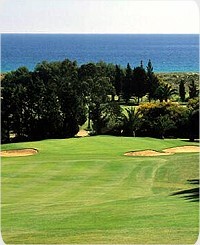 At present there are no villas lining the fairways so the feeling of openness as you play is very refreshing. Via Infante (A22) - Take Mexilhoeira Grande Exit-3 and head south. At the roundabout which joins the Road EN 125 bear to the right and follow the traffic into the village of Odiáxere. At the third traffic lights in the village there is a sign indicating the Palmares course turning to the right. Drive past the small garden and down a slope and follow the road and signs to the course.